Our Accu-Therm Hot Packs feature a reinforced soft nylon pliable poly bag with heavy duty seal that is more comfortable and conforms better than our Standard Hot Pack. 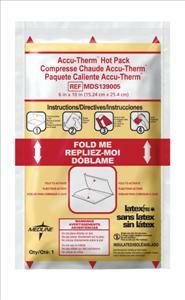 Our Standard Hot Pack features a standard weight poly bag. A compress holder is required because these hot packs should not be applied directly to the skin. Insulated, 6" x 10".